Ancestry Records indicate that only one Risley family is known to have come to America. They came from England to Boston, then to Hartford Connecticut. From there the Arkansas branch went to New Jersey, Kentucky, Indiana, and then to Missouri. Silas Risley was in Ozark County Missouri in 1820, moving from Indiana with sons Benjamin and Burton. Benjamin married Sarah Brown but died before 1860 and Sarah remarried Arch Anderson. By 1870 their children, Catharine, Louanna, Maranda, and Oliver had moved to Peel, Arkansas. 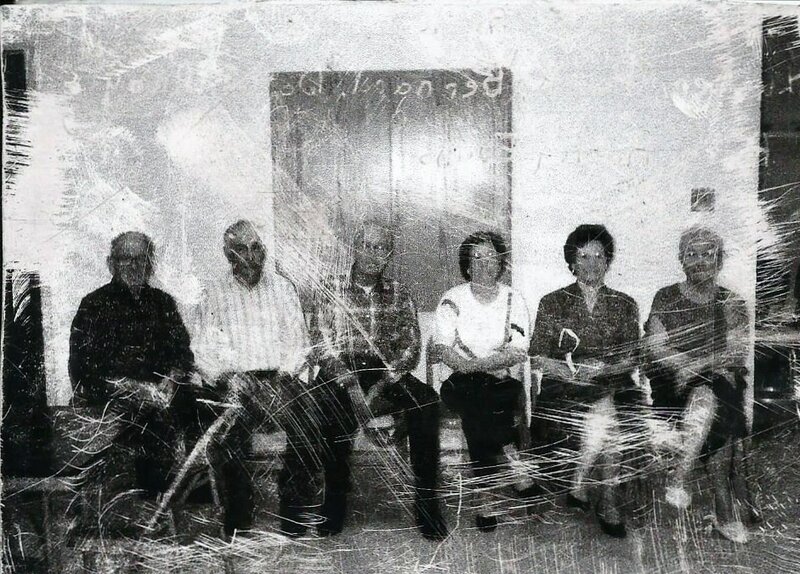 Oliver married Nancy Ledbetter and their children were May, Virgil, Ross, Troy, Minta, John, and Burl. 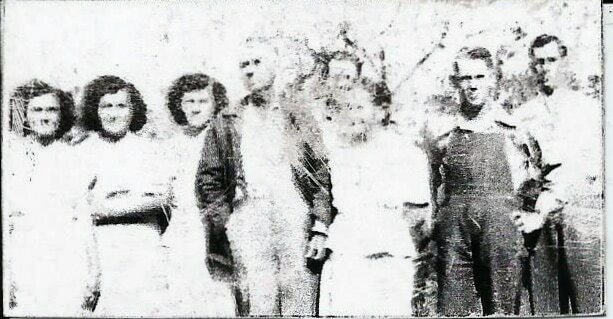 Oliver and family moved to Oklahoma in 1903, but moved back to their farm at Peel after 3 years. Oliver Lee Risley and Nancy Elizabeth Ledbetter Risley- married Sept.19,1875 Back L-R May Risley Groves, Alice Risley Yocham, 2nd row Virgil Risley, Oliver Risley, Nancy Ledbetter Risley, Ross Risley front row Troy Risley, Minta Risley Farmer, John Risley. Oliver Risley (b. 4-22-1852 Ozark County, Mo. 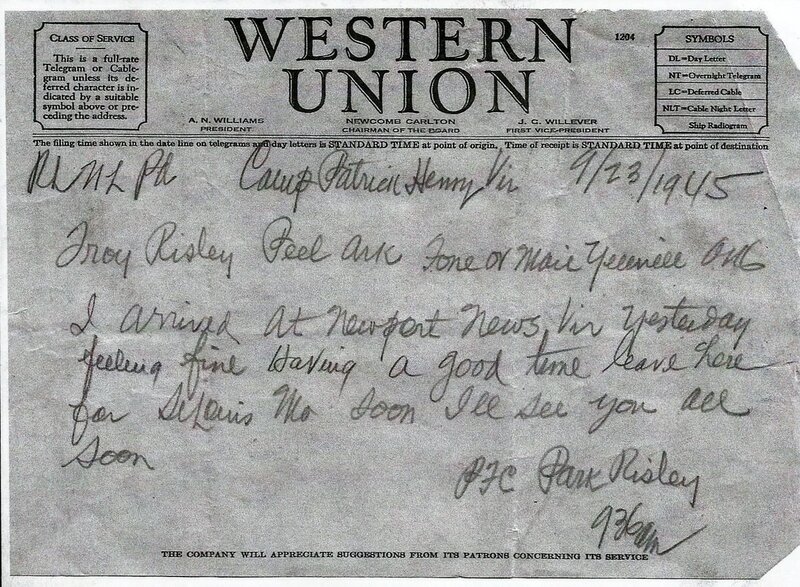 d. 2-24-1930 Peel, Ar.) was the Grandson of Silas and Catherine Adams. Nancy Ledbetter (b.1-29-1858 Texas County, Mo. 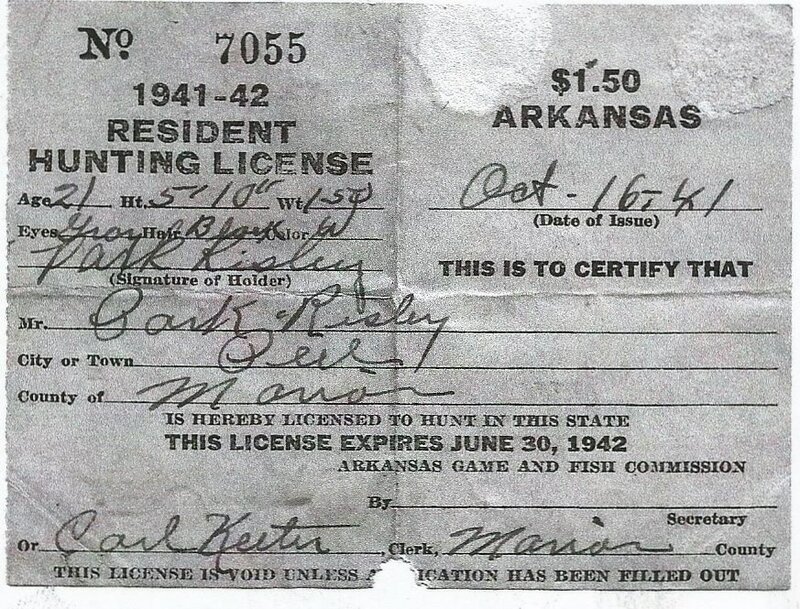 d. 3-24-1933 Marion County, Ar.) was the daughter of Jones Ledbetter and Cathrine Nation Ledbetter. Both are buried at Peel Cemetery Marion County, Ar. They were the parents to Lilly Mae Risley Groves, Alice Risley Yocham, Virgil Elmo Risley, Ross Lee Risley, Troy Benton Risley, Arminta Risley Farmer, John Oliver Risley and Burl Risley. Troy married Garla Barkhimer and their children were Bernard, Park, Luster Ruth, Ruby, and Dottie. The Risley Family Grows up, lives, serves, and works together! Troy Bernard & Ross Risley killing hogs! Park Risley as a young boy! Virgil Risley no date, but I'm thinking probably 1920's. He and grandma Risley were both teachers at Peel School. Can you imagine teaching your own kids? I have their school bells from their desks! Leaving the wolf fast in the trap I sought the assistance of Ben Risley and Levi Graham which was willingly given. With chains, ropes and stout thongs of dressed .